Is this the one at Delhi? 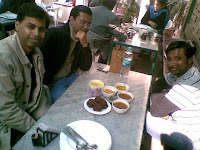 The irony was that we went to Dilli Haat after that. Surrounded by food stalls and a Waswan food festival. I was tearing my hair. 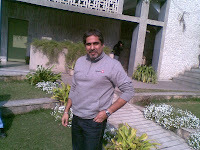 After trudging at the Auto Expo for two days I woas out of action when I finely reached an Exp;o of my choice. And the least Triveni could do, given their poor quality control, is to keep soap in the loo!!!!! Could have been a bad day. Generally they keep it simple. 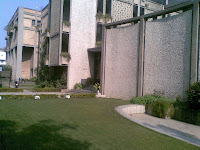 Can offer to take you around in Delhi the next time you are here. i am surprised you give the credit to the women in TOI for introducing you to fabindia kind of places....as far as i know..you knew them all when we first met..brings back memories of 1991-92 when we explored all these places...triveni is a favourite of our little one as well...i had taken her to experience the snacks ...remembering the samosas we used to go for..Ananya loved the aloo tikki with sprinkled chat masala. ranjan my first boss also used to love triveni. i remember going for many saturday lunches with the entire team. 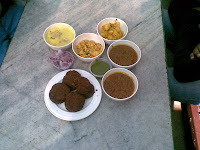 we would gorge the kebabs, keema and kadi..the kadi is very yummy too. 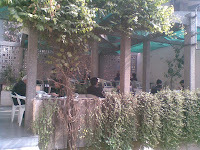 I have introduced triveni to colleagues, family , friends...each one loved the setting and the experience. it must have been the pioneer in alfresco dining in the seventies. we must go their soon. am feeling really bad that i had to miss this one, that too for a very boring review . the pic would've also looked better with me in it !!!!!! Lots of good reading here, thank you! I had been looking on yahoo when I uncovered your post, I’m going to add your feed to Google Reader, I look forward to additional from you.